Seems like Nokia has got many more devices to launch this year. Nokia recently introduced Nokia 6 smartphone in China. 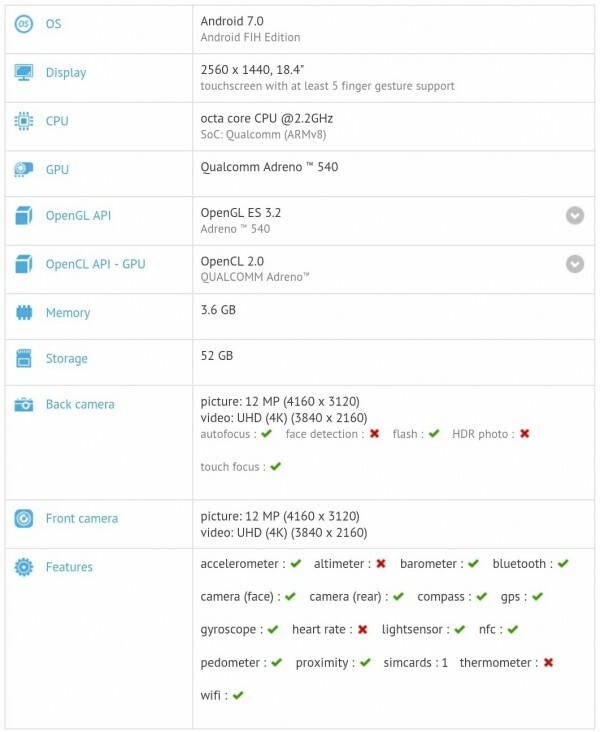 However this phone was spotted on benchmark sites before the official launch. Now a new device has been spotted on GFXBench benchmarking site which is most probably a new tablet from Nokia. It seems like Nokia isn’t only focusing on smartphones but also on the tablets this year. However this device hasn’t been named yet on the site but the specification are revealed. The leaked Nokia tablet features a huge 18.4-inch display with a resolution of 2560×1440 pixels. It is powered by the new high-end Qualcomm Snapdragon 835 octa-core chipset clocked at 2.2GHz, coupled with Adreno 540 GPU. It comes with 4GB of RAM and 64GB of on-board storage. Camera optics include a 12 Megapixel of front camera with auto-focus, face detection, flash and a 12 Megapixels of front camera for amazing selfies. Both front and rear cameras support video recording upto Ultra-HD (4K) resolution. Connectivity options include 4G LTE, WiFi, Bluetooth 4.1, GPS, NFC. Sensors include accelerometer, barometer, gyroscope, ambient light sensor, proximity, pedometer and a compass. It runs on Android Nougat (7.0) with custom UI Android FIH Edition on top. Just like the Nokia N1 tablet, this one is also expected to come in a full metal unibody chassis which looks really beautiful and classy. We also expect it to launch in two variants, one with LTE option and one with only Wi-Fi. At this point, it’s really tough to say anything about its price or availability. However, since this device will be the closest competitor of Samsung Galaxy View, we may expect the pricing to be near that. Looking at the Nokia comeback strategy, we believe that Nokia may soon reveal this device officially. Nokia is also planning to come up with a couple of other smartphones in the near future.